Finished a pair of Happy Holiday socks! This pair will be given to my brother’s girlfriend, Heather. Last year I gave her a couple of scarves and Calorimetry (here) to match. These were a few of the first things I ever knit and weren’t much to brag about. But she loves them, and here’s hoping she’ll like her new knitted goodies this year! Yarn: Lorna’s Laces in colorway 208 – Edgewater (isn’t that just the coolest sounding name?). Pattern: Anastasia Socks by MintyFresh (pattern can be found here). Yes, those are my feet modeling the socks. I couldn't help it! I love the pattern (see my Anastasia Socks in Claudia Handpainted Yarn here), and the yarn! I'll post a pic with Heather wearing the socks, but of course not until after Christmas. I hope they fit her (we wear the same size shoe, so I am pretty sure they will fit). I am in LOVE with Lorna's Laces. The yarn is so soft and it is pretty durable. And the colors! 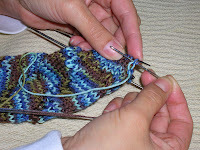 I already have a new colorway (again one of the Shepherd Sock's), which will go to a pair of socks for mum! 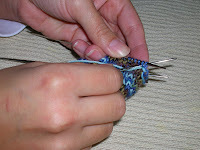 1 – Cut the yarn so you have enough (yes I messed this up right away), and thread onto a tapestry needle. 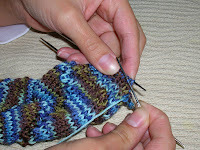 2 – Go thought the first stitch knitwise and slip that stitch off (make sure to not pull tightly). 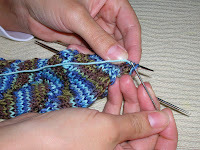 3 – Insert needle purlwise in the (now) second stitch on the knitting needle. This will need to remain quite loose. I pulled this step tight and had to rip back and do the whole bind-off over so it was loose enough (okay, I had to do that twice). 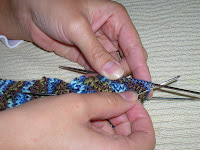 4 – Now insert needle purlwise in the first stitch and slip that stitch off – a total of 2 stitches have been BO. 5 – Next, insert the needle into (between) the first and second stitches, from the back of the work to the front. 6 - Finally, your yarn should be in the front of your work and now insert the needle knitwise into the second stitch so your yarn is again in the back of your work. 7 - Repeat this until you have BO all stitches. Maybe next time I do a toe up sock I will FINALLY remember how to do this BO properly!